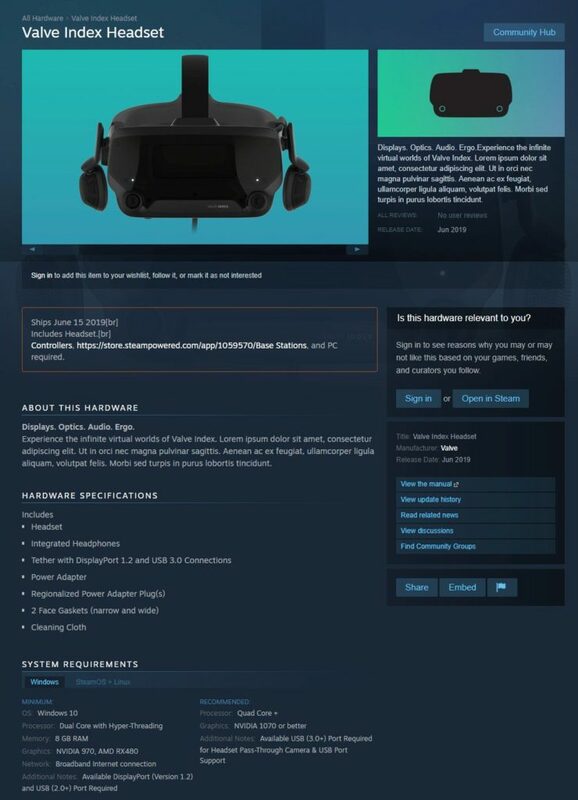 Since Valve teased the whole of the metaverse with an image of their upcoming Valve Index headset, the VR user base has been rife with rumours. Then cue the leak of information via a page appearing on Steam on the 1st April, which has The VR Realm thinking… ‘No fooling me Valve’ with shake of the fist. But, then hold on Valve have confirmed the details are correct. This was first noticed by Wario64 on Twitter and the placeholder on Steam has now been removed, but this can be seen below. This included some important information like the shipping date of 15th June, an updated image of the headset confirming built-in headphones and min and recommended specs for your PC. The spokesperson also said that the company is targeting May 1st for a full reveal of the headset which will include pre-orders, with shipping planned some time in June (though the exact date is not yet confirmed).